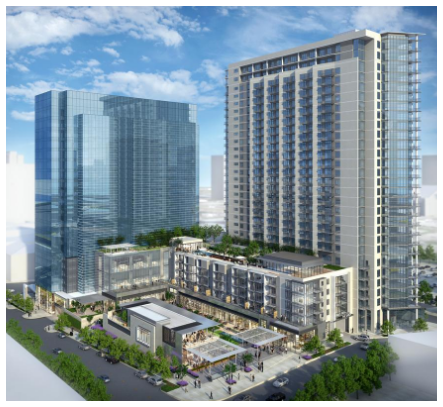 ​ DALLAS –The Union Dallas development will soon begin the vertical phase on the mixed-use development near Uptown and downtown Dallas. The number of workers will increase from 50 to 200 before the end of December 2016. The development firm began construction on The Union Dallas in April 2016. At completion in 2018, The Union Dallas will bring a 22-story office tower and a 23-story apartment tower to this part of Dallas. The mixed-use development will add about 800,000 sf at Field St. and Cedar Springs Rd., with 87,000 sf of retail and restaurant space, an outdoor plaza and ten levels of parking. Law firm Vinson & Elkins will occupy about 82,000 sf within three floors of the office tower. Independent accounting firm Weaver will occupy about 58,000 sf, or two floors, within the tower. Dallas-based StreetLights Residential, which is leading the development of the apartment tower, also will move its headquarters into the office tower. The project also will include a 60,000-sf Tom Thumb grocery store and two new eateries to the city. Click for a ​variety of DFW Market Research for Multifamily, Office, Retail, and Industrial.